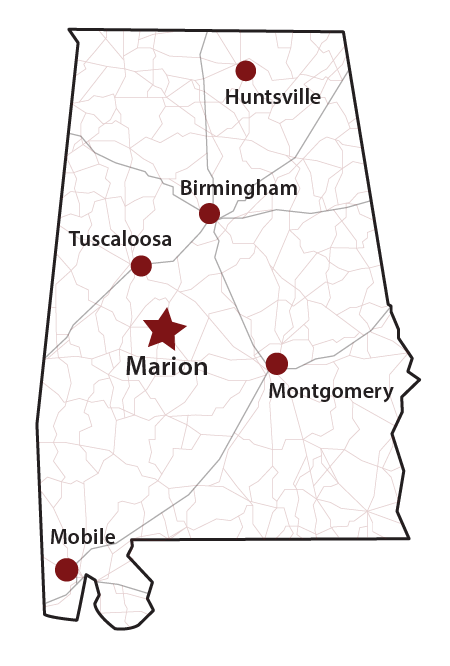 Judson is located in Marion, AL, which is in the west central part of the state. Deep in the heart of the Alabama Black Belt, the area surrounding Judson is one of extraordinary natural beauty, unique culture, and rich history. Campus is just two blocks from shopping and restaurants in downtown Marion, and a wildlife park and access to the nearby Cahaba River give you lots of opportunities for outdoor recreation. Marion is within easy driving distance from Selma (30 mins), Tuscaloosa (45 mins), Birmingham (1hr 15mins), and Montgomery (1hr 30 mins). The map below picks up after you’ve gotten mostly to Marion’s vicinity. You can choose to get directions to any point on the map using the diverging arrows that appear when the point is clicked. For the simplest navigational experience, make sure the way you’re coming is the only set of directions checked.